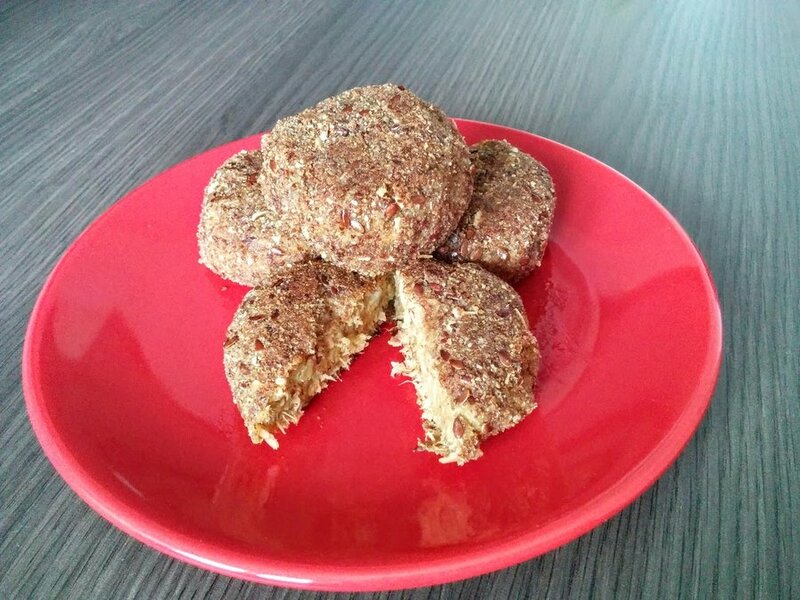 You can see 2 types of fish cakes' recipes on the Internet: too easy - just potatoes and fish, and overly complicated - lots of ingredients, special potatoes, additional sauce, etc. My recipe's in the middle - it's quick and easy but inventive . There are champignon mushrooms and lots of garlic to enhance the flavour. As a healthy binding ingredient I use ground oatmeal and free range eggs (I'm one of those fortunate people who have access to eggs from free and happy hens). What I like about these fish cakes is that they're filling, easy to make and, most importantly, everyone likes them! Added bonus is that you can leave a batch of them uncooked in the fridge and you're done with cooking for a few days - lots of time saved. Yay! As a matter of fact, you don't need to follow the rules strictly. If you're not a big fan of mushrooms, swap them with red pepper or forget them (I've also tried fish cakes with red pepper and liked the mushroom version best). If you prefer salmon, don't bother with tuna, etc. 1. Boil the potatoes. I always add turmeric so they get nice and yellow. You can also use leftover mash from the day before. 2. While the potatoes are boiling, chop the onion, mushrooms and garlic and fry them. 4. Add all the other ingredients: tuna, fried onion, mushrooms and garlic, spices, eggs and ground oatmeal. Mix them all with the potato mash. Some people like extra large chunks of tuna in their fishcakes. I prefer rather smooth pulp. 6. Dip them into beaten eggs, then into the mixture of ground flaxseeds, oatmeal and nuts. 7. Fry the fishcakes on both side into nice brown colour. It's always check if the clarified butter is hot enough - if it's cold, your fishcakes will absorb much more fat than you would like them to. You may think - what a weird coating. Well, yes, the coating is rather extraordinary - I try to avoid flour and I don't see any reason why I should cover fishcakes in this tasteless white powder. Eggs and seeds are more than enough. And yes, breadcrumbs are boring. I like fishcakes so much that I don't need any sauce or side dish - I gobble them down in a blink of an eye 😉 However, if you feel you need something moist to accompany your fishcakes, then prepare tartare-style sauce - mayo, minced onion, a bit of pickle relish, salt and pepper and voilà, you're done!